Amanda Jackson Band: AJB & Friends Concert Series ft. Erin Costelo! 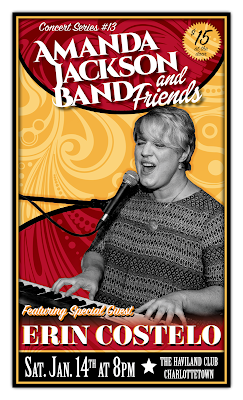 AJB & Friends Concert Series ft. Erin Costelo! It is with mixed emotions that we write this post. We're thrilled to announce that the incredible Erin Costelowill be joining us for the 13th edition of our Amanda Jackson Band & Friends Concert Series, but sad to let you know it will be our final AJB & Friends show, for now at least. We have a busy 2017 ahead with recording and shows, so we will be putting it on hold for now to concentrate on these other projects. We're so thankful to everyone at The Haviland Club, the audience members and to all of our amazing guests who have made this series a success and look forward to many more collaborations in the future! Click here for all of the details of the event on Saturday, January 14th, 2017 and we look forward to seeing you there!